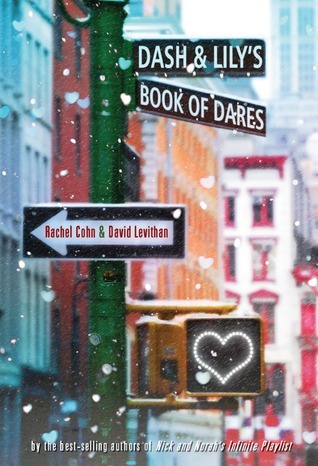 I was totally ready for this book of dares. The idea totally excited me. Answering questions from a stranger? Sending them on dares to find more questions? Yes, please! I see romance in the New York City air! New York is another character in this story.We're taken on a scavenger hunt really and it feels nice when a setting comes alive. I've not been to NY in 20 yrs! Oh geesh, I'm showing my age. But, it made me want to go back. It felt good. Lily and Dash's parents have both left them for the holiday's. Ironic or destiny? Dash is looking in a book store one day and finds a notebook that Lily has left on the shelf for someone to find. Inside are questions and dares. Will he do them? It was so totally fun to follow their red notebook. I wanted them to find each other. They were perfect for each other! I was not a fan of the ending. It was....anti-climactic. Completely. I was like what the what? That's it? What kind of teenager is he? I expected more. With that kind of buildup. Come on!! Disappointed. The ending could have been--should have been--epic. I agree, I loved this book! But I was disappointed with the ending too. It was exactly as you said. I turned the last page and I was like "What? That's it?" I know! It was the build up. It led to....nothing. What was the point. I felt let down. I'd invested my time and emotions into a relationship that didn't give me anything back. It was all set up to just be epic, but it wasn't. It is times like these that make me wonder where the editor was?? I read it last month and personally loved it. I have found that David Levithan favors Happy For Now endings rather than Happy Ever After which makes many of his endings unusually subdued. I wish i had my copy here (I lent it to fellow Bibliojunkie, Bel) because I don't remember the exact ending. I just remember that it was anticlimactic but I didn't mind because I felt it was fitting for the characters and the situation. In the end it made me feel content which is kind of my favorite thing for a "holiday" book.